When organizations look to remove cost from the business, they should in fact increase the budget assigned to electronic communication and aggressively chase a greater decrease elsewhere. 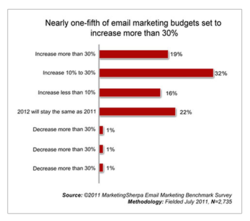 67% of organisations are already doing so, according to Email Marketing Benchmark Report. A generous electronic communication budget will save costs elsewhere in your business, according to Alison Treadaway, MD, Striata SA. "When organizations look to remove cost from the business, they should in fact increase the budget assigned to electronic communication and aggressively chase a greater decrease elsewhere. This is because of its attractive business case and rapid return on investment. The majority of our high volume financial services and biller clients realize a positive ROI in three to nine months and continuous project profitability thereafter." According to MarketingSherpa 2012 Email Marketing Benchmark Report, 67% of organizations planned to increase their email budgets in 2012. Treadaway explains, "There are quick wins to be gained by replacing paper based processes with electronic communication. Organizations with large consumer bases will benefit significantly, as will B2B organizations which are heavy on documents or transactional notifications. The business case in its simplest form involves sending an email or text message (SMS) instead of a letter by post, at a fraction of the cost and double the efficiency." "The investment in process reengineering (opening digital channels) and change management (redirecting staff and key performance indicators) will be a small price to pay once the real returns of an electronic communication program are measured." •Combine operational and marketing messages: many operational messages (statements, invoices, transactional notifications) are left to do a single job. Rather incorporate a marketing message and do away with a printed brochure or campaign expense, thereby saving costs and simplifying the customer experience. •Use your electronic communications to reduce customer service calls: making small changes to printed communication can be like steering a really large ship, but electronic communication allows a much nimbler approach. Track your high volume customer service calls, and provide the answers or a self-service channel in your communication. •Focus on conversion: Once you have completed the development required to open up the digital process, you need to actively convert customers and get consent to communicate electronically - simply creating the digital channel doesn’t mean your communication types or your customers are converted automatically. The higher your adoption, the faster your return on investment. •Have a paper turnoff strategy: make sure you have buy-in within the organization for the suppression of paper. This is often assumed as a given, and many a business case has been foiled by poor planning around the technical and process aspects of switching off paper. Make it your goal in 2013 to replace your paper processes with direct digital communications and eliminate costs elsewhere in your business, gain a healthy net saving and improve efficiency in general.